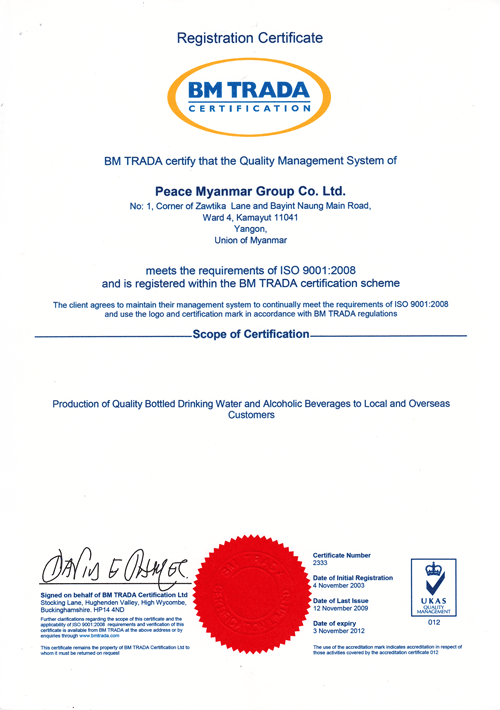 Since 1993, we have been one of the leading producers and distributors of alcoholic beverages and bottled drinking water in Myanmar. The company’s beginning was humble but profound. When we saw that many local consumers were getting diseases and dying because of poor quality beverages, we decided to step up to create a startup that would provide high quality beverages for the local consumers. We have stayed true to this vision of providing high quality beverages while building a company that cares deeply about the people – our consumers, customers, employees and community. 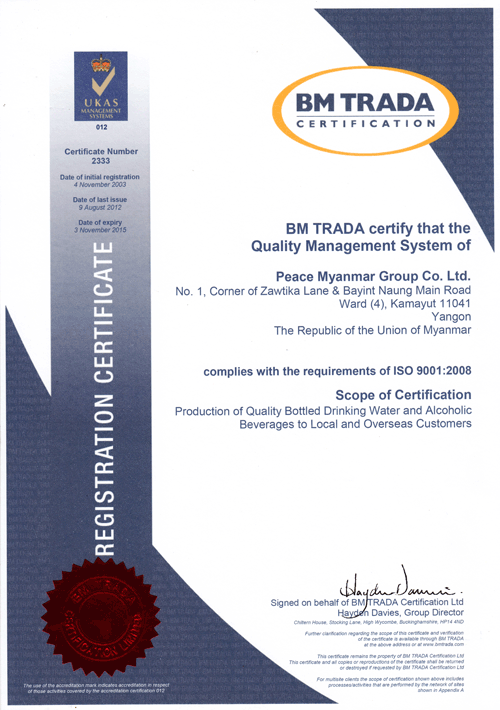 Through 3 decades of existence, we were pioneers in quality standards by becoming one of the first ISO9001 certified consumer goods companies in the country. We have passed every FDA surprise audits while other companies have missteps. We provide livelihood for almost 2000 employees. We have also given life to a distribution company Skyward that serves customers all over the country. Looking forward to this new era of change and opportunities, we hope to be a leading company that positively contributes to the lives of our stakeholders. 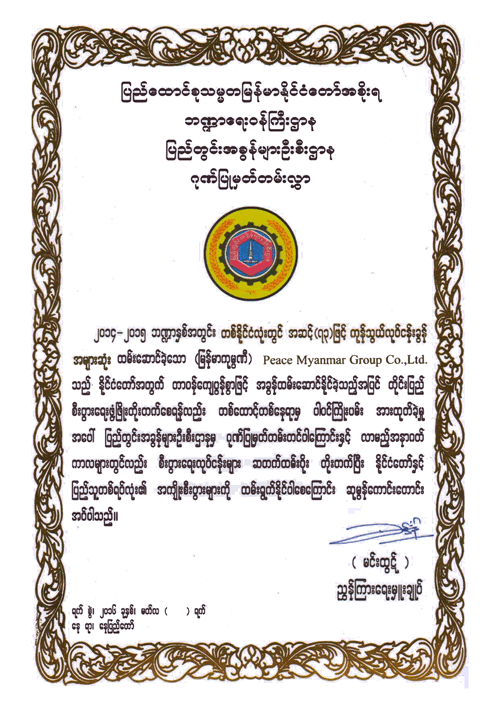 Our production company, Peace Myanmar Group (PMG), continues to provide beloved market leading products as well as research product innovations. 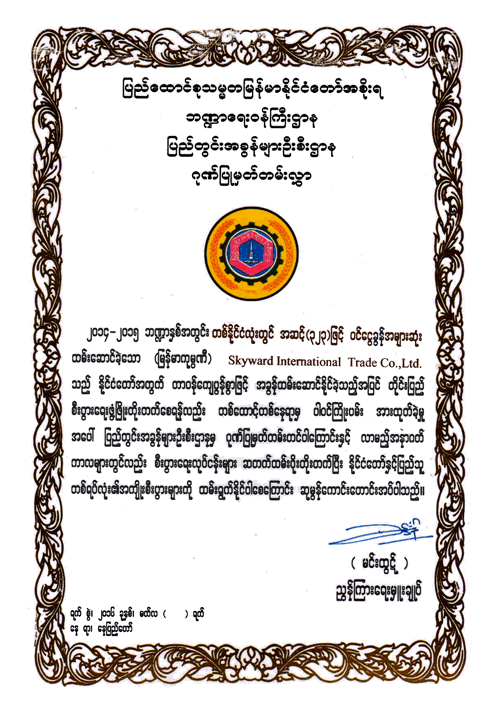 Our distribution company, Skyward International (SKW), continues to expand our reach nationally while striving to provide superior customer service. 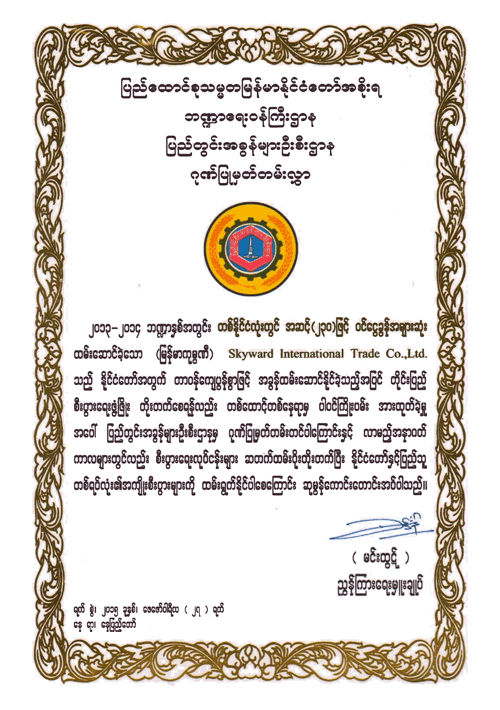 We are confident that our company will grow over time with the opening up of Myanmar. I wish to express gratitude to all our existing consumers, employees, stakeholders and welcome new ones who will celebrate all the golden opportunities. A company born of a distillation of lofty ideas. 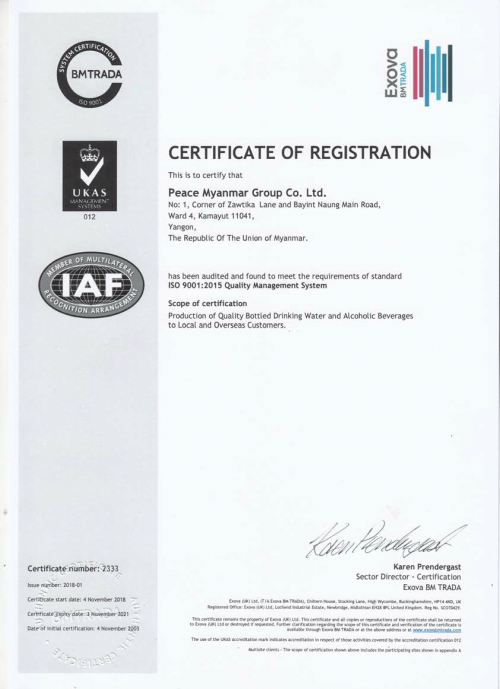 Creating quality beverages in Myanmar for a quarter of a century, PMG has been a leading force in both alcoholic beverages and bottled drinking water. 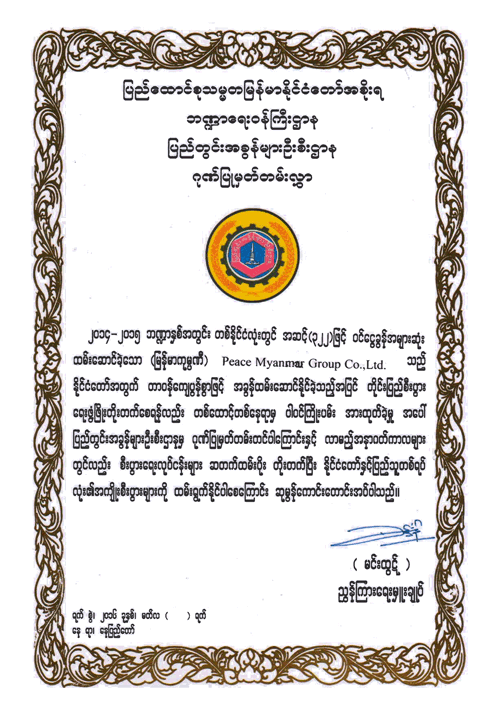 Uncompromising in quality and staying true to our roots, we crafted our first products under the Myanmar line – Myanmar Rum, Myanmar Whisky, Myanmar Dry Gin and Myanmar Drinking Water. These have become classics loved by the Myanmar market and are joined by several new products such as Majesty Whisky, Chancellor Whisky and Crush! Drinking Water, our environmentally-friendly line of plastic bottles. 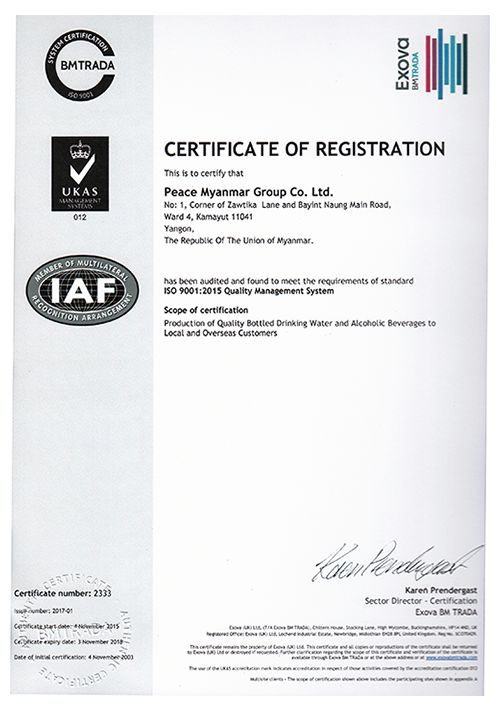 As the production company, PMG practices the highest quality standards in both the alcoholic beverages as well as the bottled drinking water manufacturing. As the distribution company, Skyward extensively and intensively brings our products to market with customer success as the top priority. We aim to bring people together. We honor the strength and resilience of Myanmar people during difficult times. Now, at the start of the new era, we passionately encourage the pursuit of better opportunities. We hope you come along for the ride a consumer, customer, or team member. We are the spirit of Myanmar. A quarter century, innumerable challenges and one goal: to lead by example in creating winning opportunities for our stakeholders. This means best quality products created by an inspired team setting high bars for the industry and getting these beloved products to our consumers through strong partnerships with our distributors. 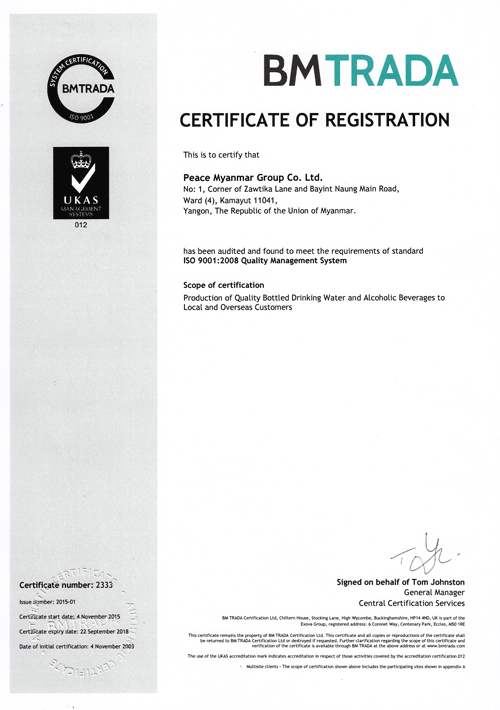 To be sure, our mission is to produce and distribute quality products for customers. But in this process, we also transform and elevate company’s staff as human capital for the country. 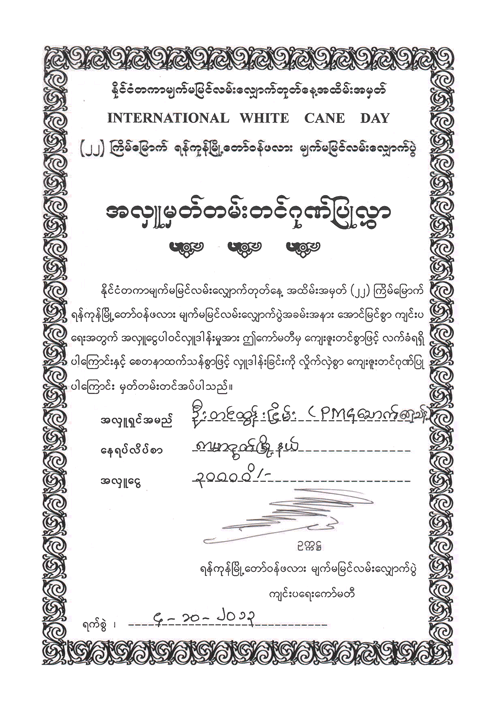 At the end of the day, we aim to build a legacy that Myanmar can be proud of for generations to come. 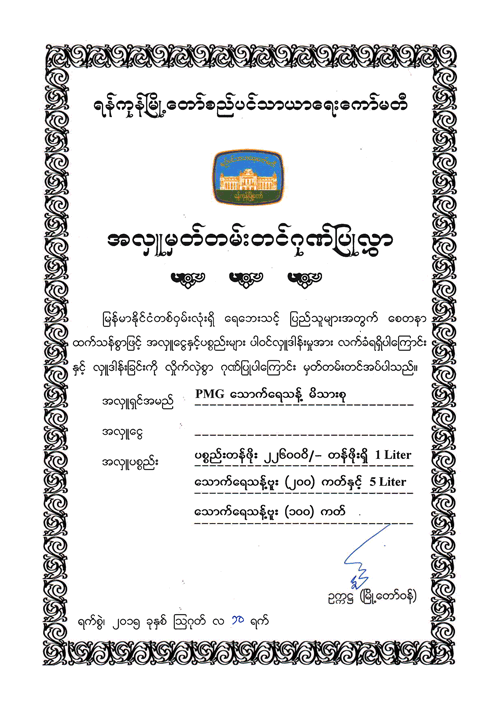 PMG aims to be a top quality producer of bottled drinking water and alcoholic beverages and a leader in the industry in Myanmar. It will ensure that its resources are optimally utilized and its production processes continually improved. 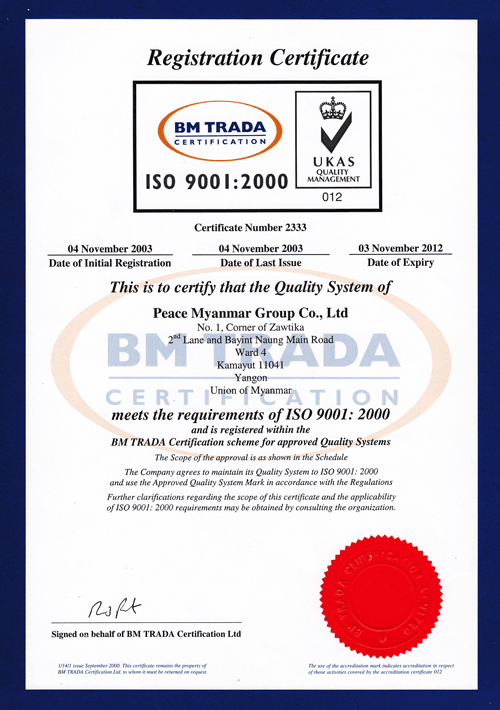 Its operational procedures will be in compliance with the quality management system requirements of ISO 9001:2015. 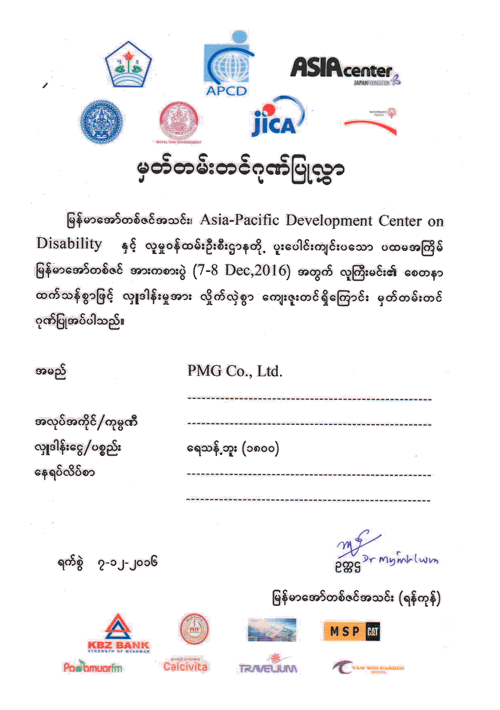 – PMG shall conduct quality meetings regularly to review the effectiveness, suitability and adequacy of its QMS while continually improving it. 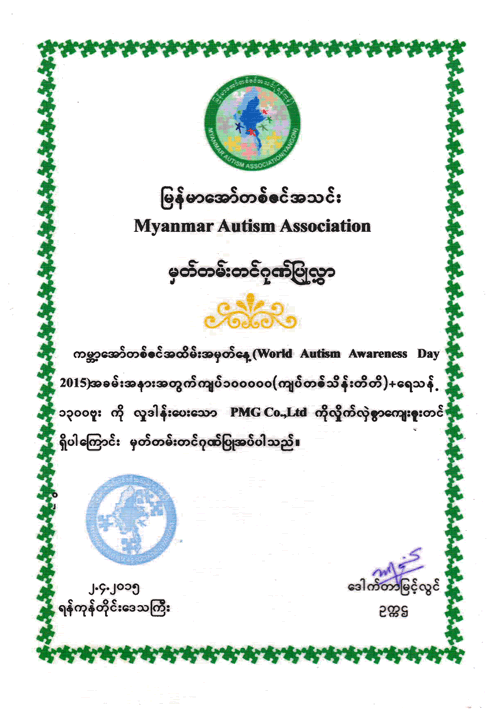 – PMG is committed to satisfy the applicable legal, statutory and regulatory requirements.